We all know that Valentine’s Day is a great time to plan romantic outings for couples, but what about if you have kids? There are many fun and affordable ways you can celebrate Valentine’s Day with your kids and still have time for that romantic outing. Here are some of our favorites ideas. When I was young, we ran to the store and bought a box of printed Valentine’s Day cards for a few dollars. We then spent the night before Valentine’s Day, writing the name of each kid in our class on the card and handing them out the next day. And that was that. These days, there are many wonderful options that allow you to spend time being creative with your kids, and then your child gets to hand out the DIY cards. They are sure to be a hit with the entire class. 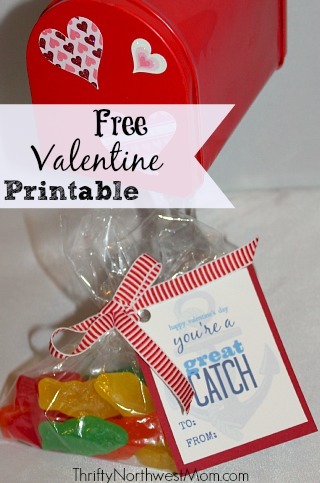 “You’re A Great Catch” Valentines Day Printable. We like this one because you can use candy fish or fishy crackers if you are hoping to avoid handing out sugary sweets. “You’re A Winner” Valentines Day Printables. This one is fun because you can use chocolate coins or many dollar stores have little medals you can buy in the party favor section for a non edible option! “Glow Stick” Valentines Day Printable. This one is super affordable as one bag of glow sticks from the dollar store will go a long way with this printable! In addition to Valentine’s Day cards, kids often like to take treats to their school parties or have some around the house to make the day feel special. Here are some fun ones that you can have your kids help you make! We loved these Valentine’s Day necklaces made with dried fruit. They are perfect because a) they are not full of junk food, and b) the kids can make them themselves (so it acts like a craft and recipe)! Heart-shaped fruit kabobs. 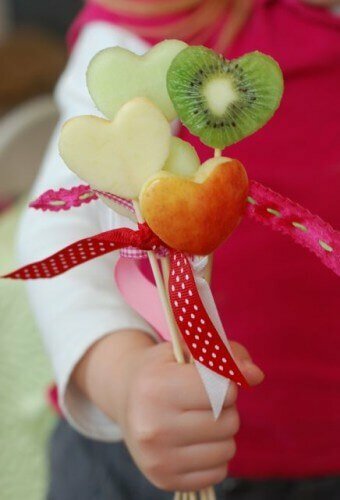 Lay out different plates of fruit options (use cookie cutters to make them in the shape of a heart), and then give the kids skewer sticks and let them make their own fruit bouquet! Lots of fun and it’s a healthy option too. Make a heart-shaped pizza with the kids. This is another great recipe idea that the kids can get involved with making and creating their own personalized pizzas. We do this with our kids annually and they love it! These personal pizzas make a great family activity, but they are also perfect if you plan to go out for a special adult dinner to celebrate Valentine’s Day. Leave the sitter with all the ingredients prepped and ready to go, and now you can relax at dinner knowing your kids are having fun too. Give your kids different colored sheets of paper and have them write special messages on them for everyone in the family. Then have each person close their eyes while the other hides the message someplace they think they will find it throughout the day (in shoes, under hair brushes, etc.). The game then lasts all day as different family members find their special messages! In this Valentine’s Day version, you would prep ahead by printing out quarter size photos of various couples and best friends in your family. So for example, you could print a picture of you and your spouse, your child and their best friend, grandma and grandpa, etc. You will want approximately 12 pairs of people. You only need a quarter-sized image of their face, and can print in black and white to keep this game frugal. Once the images are printed, simply glue them to some playing card size card stock (index cards will work too). You can have the kids decorate the back side of the card stock in hearts and other festive designs before you glue the pictures on. Once the images have dried, place them face down and have kids find the matching couples to get a pair (i.e., they would need to find the photo of you and your spouse to have a match).